Labour Day weekend is our annual Monarchs and Migrants weekend. Just as May is the big month for north-bound migrants, September is best to see those heading south. The big bonus however is that insect migrants are more noticeable at this time of year. Bird banders, Elizabeth Kellogg and Roger Frost, will be here both days from 8:00 am to noon to demonstrate the catching and banding of migrating birds. Find out how banding is done, learn what this technique can tell us about bird migration, and get a chance to see birds up very close! 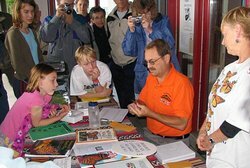 Don Davis will also be here with his very popular Monarch Butterfly tagging demonstrations from 1:00 pm to 3:00 pm both days. The chance to release a tagged butterfly is the highlight of the year for many of our visitors. We will also have walks to look for migrating birds, butterflies, and dragonflies (yes, some dragonflies do migrate). See Calendar of Events for dates. Contact David Bree at 613 475 4324, ext-225 or david.bree@ontario.ca for more information or if you are interested in volunteering.